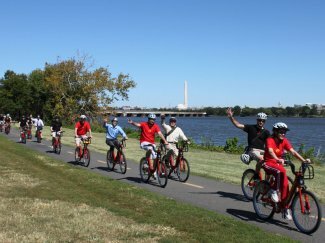 What better and fun way to get around Washington, DC and avoid the traffic jams than by bike? Capital Bikeshare puts over 1670+ bicycles at your fingertips. You can choose any of the 175+ stations across Washington, D.C., Arlington, VA, and Alexandria, VA and return it to any station near your destination. Please review the Capital Bikeshare Terms and Conditions before purchasing bike rental passes. Visit the Washington Area Bicyclist Association website for information on Washington, DC bicycle guidelines.